Not only is the polar bear the biggest bear species, it is also the world’s largest land carnivore. Males can weigh up to 800 kilograms and reach lengths of up to 2.8 metres, while females can weigh up to 400 kilograms and reach lengths of up to 2.5 metres. This bear has a long, narrow head and snout with a black nose. Its entire body is covered in dense, water-resistant fur that is yellow or off-white in the summer and white the rest of the year. The fur even covers its paw pads, insulating its feet and providing better traction when walking on snow and ice. This fierce carnivore is equipped with strong, sharp-clawed and slightly webbed paws. It uses them for swimming, climbing on and digging through ice and snow, collapsing seal lairs and hunting seals. Polar bears are found throughout the Arctic in Alaska, Canada, Greenland, Norway and Russia. In Canada, they inhabit ice-covered regions from the Yukon and the Bering Sea in the west, to Newfoundland and Labrador in the east. 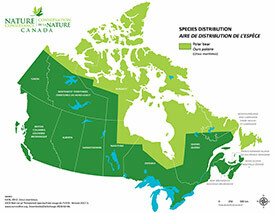 They also range from Northern Ellesmere Island south to James Bay. Two-thirds of the global population of polar bears are found in Canada. The world’s southernmost population of polar bears occurs along the coast of James Bay in Ontario. These bears typically occupy the coastal regions of the Arctic Ocean and the channels between its many islands and archipelagos. Their habitat changes according to the season. For example, in places where sea ice melts in mid- or late summer, all polar bears move to the shore for two to four months. During this time, they rely on fat stores for survival. Once autumn arrives, they go back to the sea ice. 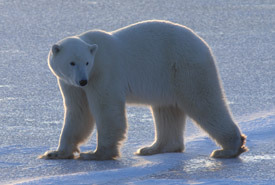 Polar bears depend heavily on sea ice, using it for hunting, travelling and mating. Polar bears are carnivores, and their preferred prey are ringed seals. When hunting on the sea ice, they search for areas where seals may come up for air, such as cracking ice, ice edges and breathing holes. Although they prefer ringed seals, polar bears also eat other seal species and animal carcasses, including whales. A single polar bear can consume up to 46 kilograms of food in one meal. Polar bears face many threats, including climate change, contaminant exposure, resource industry activities and conflict with humans. In the long term, climate change is the most serious of these threats. The effects of climate change have critically impacted the amount and thickness of sea ice, decreasing polar bears’ primary habitat. The Committee on the Status of Endangered Wildlife in Canada last assessed and designated polar bears in 2008 as a species of special concern. The species is listed as vulnerable on the International Union for Conservation of Nature’s Red List. In 2016, the Nature Conservancy of Canada (NCC) helped clear one of the final barriers in establishing a National Marine Conservation Area in Nunavut’s Lancaster Sound by accepting more than 8,625 square kilometres of offshore exploratory permits from Shell Canada. These permits were then released to the Government of Canada, facilitating the establishment of this new Marine Protected Area that includes important polar bear habitat. Polar bear is one of 25 species or landscape options that can be symbolically adopted through NCC’s Gifts of Canadian Nature gift-giving program, that contributes to critical conservation work across the country. Your gift will help care for habitat that polar bear and other species rely on for their survival. You will receive a tax receipt for your donation, and you will help protect our country’s natural areas and the species they sustain—for today, tomorrow and for generations to come. Symbolically adopt a polar bear today.